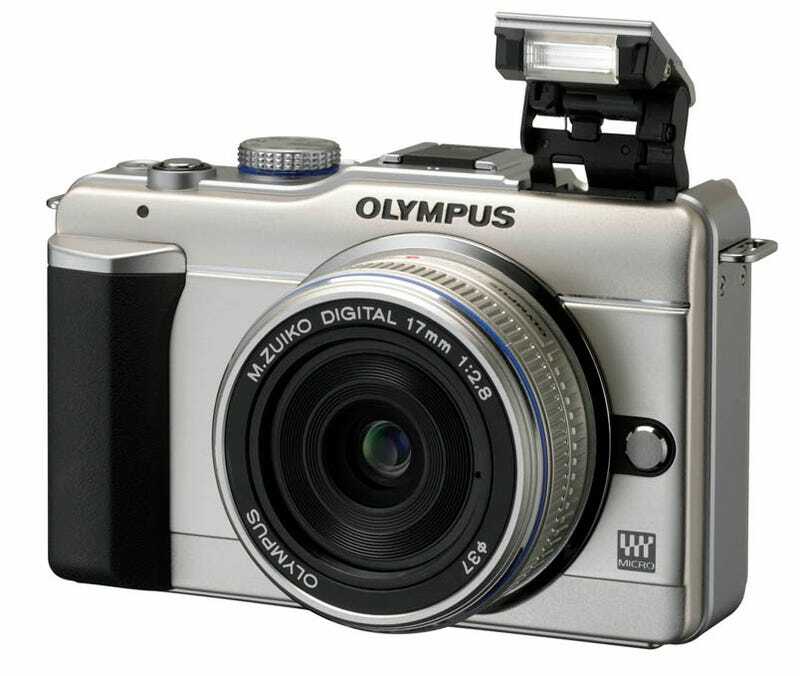 It leaked earlier today, but we're still pretty struck by Olympus's latest micro four thirds camera, the E-PL1. Why? It has a built-in flash (finally!). And it's $600, making it the cheapest micro four thirds camera around. The E-PL1 takes the opposite tack of the E-P2, stepping down a rung. So, you're probably wondering what you give up to shave off that couple hundred bucks. Shockingly little. It's got the same sensor as every other micro four thirds camera. But it's not as solidly built as the E-P1 or E-P2, trading metal for polycarbonite (but that makes it lighter), and you lose some of the controls on the back, which are shifted from dial to a d-pad + menu, so they're slower to get to. Oh, and sound for video is cut back to mono, but you can attach a stereo mic to the accessory port. I'd venture, too, that it's a little uglier than its more retro predecessors, since it's boxier in an unpleasant way though it is, to be fair, even smaller. Besides the pop-up flash and the price, the other major new thing is a revamped intelligent auto mode, which walks beginners through taking more advanced photos using plainfolks language and simple sliders for settings in the menu. For instance, white balance is shown as a scale between blue and orange, and live view adjusts the preview in real time. Aperture becomes a setting to "blur" or "sharpen" the background. Nikon's done this with the D3000, but I think the E-PL1 might be even easier to follow. Finally, we've got a pair of new lenses, a superwide 9-18mm, (35mm equivalent to 18-36mm) and a 14-150mm (35mm equivalent to 28-300mm), both with a variable aperture of f4-5.6. We care about them because they focus noticeably faster than the existing glass for the PEN series of cameras, and because they're almost totally silent, which makes them much better for shooting HD video (which now has a dedicated button). If you're going to look for something more upscale—like with a full-metal build—in the micro four thirds realm, the GF1 remains your best bet (BTW, Mark's review is a great intro to micro four thirds), but I can think of little reason to reach out for the Olympus's more expensive micro four thirds cams at this point, or at least when the E-PL1 hits the shelves in March for $600. Look out, cheap DSLRs.